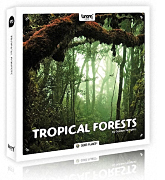 Tropical Forests - седьмая SFX библиотека внеочередной серии высококачественных и увлекательных записей Emmy-winner и гениальных записей природы Gordon Hempton. Он обыскивал земной шар более трех десятилетий для записи природы в ее самом первозданном виде. Чтобы скомпилировать это уникальное сокровище тропических лесов, Hempton не жалеет усилий чтобы собрать и обобщить огромное разнообразие облачных лесов, тропических лесов и океанических лесов Бразилии, Белиза, Австралии, Шри-Ланки и Эквадора. Как само собой разумеющееся, библиотека включает в себя различные погодные условия, такие как различные уровни ветра, сухой или влажный, осадков и даже полную 1.5 часа запись тропического дождя. Tropical Forests is the seventh SFX library from extraordinary series of high quality and fascinating nature recordings by Emmy-winner and nature recording genius Gordon Hempton. He has searched the globe for more than three decades to record nature at its most pristine. To compile this unique treasure of TROPICAL FORESTS, Hempton spared no effort to collect and compile the immense diversity of cloud forests, rain forests and oceanic forests of Ecuador, Brazil, Belize, Australia and Sri Lanka. TROPICAL FORESTS are loud and dense places – they receive large amounts of solar energy. The high species diversity of these nature reserves translates into more complex ambiences sometimes becoming symphonic with even dramatic wildlife vocalizations. So this collection delivers a real powerhouse of opportunities: it comes with recordings which you would never have thought to be within your reach, from areas far remote and inaccessible. Equipped with custom materiel and the will to record the exceptional, Hempton submerged into the wild and came back with this absolutely impressing and outstanding sound collection. The TROPICAL FORESTS library literally melts you into an exotic soundscape. You’ll find recordings of every time of the day, from dawn until dusk and throughout the whole night, with fine gradations to do justice to the ever-changing acoustic diversity of the forests. These ambience recordings include various tropical animals such as birds (solo and duet), insects, frogs, monkeys, owls, cicadas or eagles. As a matter of course, the library comprises different weather conditions like various wind levels, dry or wet, rainfall and even a full 1.5 hour recording of a tropical thunderstorm. Whatever exotic adventure lies ahead of you, the TROPICAL FORESTS collection will suit your plans well. You shouldn’t miss any of the Quiet Planet SFX series, but if you are in special need of TROPICAL FORESTS, this library has to be your choice. Get ready to be overwhelmed by the lush and free nature: with its more than 11 GB, +5 hrs and a total of 153 files of high-quality material, this collection will boost your ideas and paint a full-colored stereo picture to the audience. The Soundminer Metadata has notes on species ID, when to use, and geographic location. Connect to this exotic power source and load your next project with TROPICAL FORESTS SFX! Последний раз редактировалось dushes10; 09.08.2015 в 11:01.